Another week another weigh in, I'm kind of hoping your not bored of these updates yet. It really does keep me going knowing I'm to share it all with you. Of course not quite as daunting as standing in a room full of people BUT almost the same for me. This week's weigh in bloody amazed me. Not once did I even expect to loose any weight. This week has been crap food wise not tracking or anything so to loose is a big achievement. Anyway, I'm here with another weigh in, this week bringing a loss of 1lbs, which I am amazed by after an awful week. I'm not even sure entirely what happened but Monday was very stressful at work, coming home having a bit of a breakdown and did my usual technique of comfort food. I regretted it afterwards but after an even worse day the Tuesday I turned again especially when I was made a delicious massive cooked dinner! I thought by then I'd already broken so just ate what I wanted the following two days and didn't count a single point! I weighed in and had put on 2lbs and was gutted but I still had a bit of time for my usual weigh in, so yep I attempted the oldest trick in the book and it bloody well worked! Over my four weeks I've not lost a total of 8.2lbs which I'm pretty impressed with, espeially as normally I would have given up by now. I've also started seeing a little difference in my clothing, I've still not taken measurements which I really must do. But, as for my clothing I managed to pull up some tight jeans which I normally had to breath in for without undoing the button, yes I left it fastened! My mum has also commented that she can tell some weight has been lost. 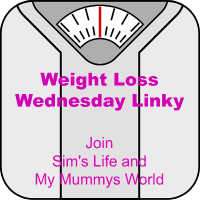 It was so lovely having the other link ups last week and I really hope you can join us again. It's lovely to have support and support others a long the way.